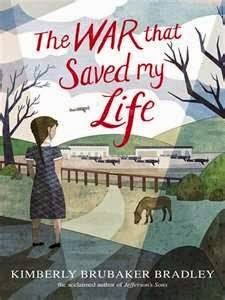 Theoretically I am only supposed to be reading books from my TBR pile until I have read 100 of them....but in practice I just had to read The War That Saved My Life, by Kimberly Brubaker Bradley (Dial, January 2015) just as soon as ever I could because how could I not want to read the story of a hideously neglected and abused girl with a clubfoot whose life is saved when WW II happens and she is evacuated to the countryside of Kent and learns to ride a pony and gets new clothes for the first time and finds out what it is like to be loved????? Ada has spent her life confined to a one room 3rd floor apartment, spending her days looking after her younger brother Jamie...or, as he gets older and goes off without her outside, simply staring out the window, or disappearing into the void of her mind. She has a clubfoot, and her mother has made it clear--horribly, abusively clear-- that she is so deformed and worthless that she can never go outside herself. Any sign of spirit in Ada is answered with violence, or worse still, she is shut up in a cabinet. Happily it turns out that Susan is exactly what the two children need, and they are what she needs as well, and Ada slowly gains self-confidence and begins to cast off the years of being told she is hateful and worthless. Susan reads to them (Swiss Family Robinson to start with), she feeds them and bathes them and braids Ada's hair, and eventually Ada thaws enough so that Susan can teach her to read and write, and to love and be loved. And also in the meantime Ada shows preternatural ability at horseback riding, which both delighted the part of me that still thinks like a ten year old girl and strained the credulity of the somewhat larger part of me that doesn't. The spy bit also was a bit of stretch....And even more so, I constantly was questioning whether Ada, the bright first-person narrator, was at all believable as a person who had suffered as much abuse as she had, and I am not convinced she was. I feel that Goodnight, Mr. Tom, by Michelle Magorian, which is a very similar story (abused evacuee finds loving home) is a stronger book, perhaps because it is not told in the first person, allowing greater suspension of disbelief. Still, my doubts paled in comparison to the pleasure of the minutia of Ada's life with Susan, and The War That Saved My Life was a single-sitting book that I enjoyed very much. * It's not explicitly stated that Susan and Becky were in a relationship, but there are plenty of clues that the reader who's aware of the possibility will pick up on pretty easily. I very much appreciated the bits of backstory to Susan's life as an Oxford educated woman disowned by her disapproving father because of her relationship with Becky, and I also appreciated how Susan's grief over Becky would resurface periodically in small but very poignant, very believable ways. This book is not just the story of Ada healing but of Susan healing as well, and this was a very nice contrast to the relentless focus on child protagonists in so much (though by no means all) middle grade fiction. I think it's nice for kids to think about how grownups feel too! WOW. Okay, I can see reading out of order for that one. This is like AAAALLLLLLLL the best wish-fulfillment novels I read in middle grade. Sounds lovely. I read this last week because of your review! It sounded like something I would love and I absolutely did. Thank you for sharing your review here! oh good! thanks for letting me know!